Alternative healing methods can also be called 'complementary'. Complementary medicine is a better name because most people use these methods as a 'complement' to conventional approaches. In recent years, functional medicine has started to emerge. Conventionally trained medical practitioners have observed the limitation of conventional methods, and the effectiveness of certain alternative healing methods. They have incorporated the alternative methods into their treatment programs. Hopefully functional medicine will continue to be adopted more widely. There are some alternative healing methods which are labelled as 'alternative' or 'complementary'. Nonetheless, they are backed up by scientific research. These tests remain 'alternative' in the UK simply in the sense that they are not yet offered on the NHS (National Health Service). It is possible that in other countries or on private health insurance such tests are available within conventional medicine. Many alternative healing methods go on to become mainstream. An old folklore remedy involving the healing properties of mould existed long before the cultivation of penicillin. Some medical practices offer acupuncture for pain relief. Some GP (General Practitioner) are trained as homeopaths. Some alternative healing methods eventually become validated by scientific research. For example, studies are now out which show the effectiveness of currently alternative methods for healing pain. Move here to read about books which include research on the effect of our thoughts and feelings on our health - the mind body connection. Online talks about alternative healing methods are regularly offered for free for limited time periods. Please click here to see if any healing programs are available at the current time. How do alternative healing tests vary from conventional tests? 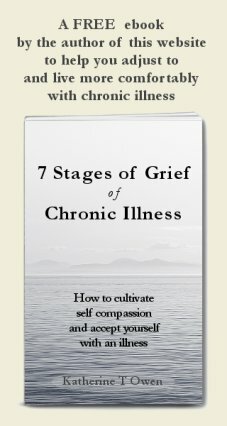 I, the author of this article, live with Chronic Fatigue Syndrome / Myalgic Encephalomyelitis. The illness is poorly understood with no official treatment. As a result many of us reach out for alternative healing. But when you live with chronic illness longterm, many people talk to you about their illnesses.I have observed that for many illnesses, conventional medicine offers no cure. Often any treatment is only about managing the symptoms. Many people simply accept a Doctor's prognosis. If told they will stay ill and get worse, they accept that. Others among us are more stubborn ;-) and reach out to alternative and complementary medicine in the hope of improvement and even recovery. There really is so much you can do. I am a particular fan of emotional healing. If you can manage the emotions that are likely to arise with chronic illness, your quality of life can be vastly improved. How do I choose among alternative healing methods? Some alternative healing tests and treatments may seem rather weird and wonderful if you are new to them. Some may continue to seem rather weird and wonderful once you are familiar with them! 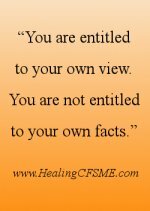 Use your judgment when deciding if an alternative healing practitioner can help you. I have never met a practitioner who was trying to con me. But I have met a few who had far more faith in their healing methods than was warranted. Many practitioners are highly trained and credited by a professional organisation. If you know the type of alternative healing you want, such as acupuncture or homeopathy, you can look up the relevant organisation to ask for a list of qualified practitioners. How does an alternative healing method vary from a conventional approach? Each healing technique is different, but there tend to be some similarities which distinguish alternative healing methods from conventional ones. With a conventional doctor you will often have tests done. These typically lead to a diagnosis. Treatment is then determined by this diagnosis. This labeling approach does not allow for individual variations in causes and symptoms. Once the label of a particular illness is assigned there is also a risk that if you develop an additional illness, it will be missed. A practitioner in alternative healing therapy typically tests you on each visit. There is little or no attachment to giving you a specific diagnosis. The treatment is tailored to your individual needs. The approach of alternative healing therapy is usually holistic - the body is considered as a whole, rather than giving treatment being given to a particular part of the body. 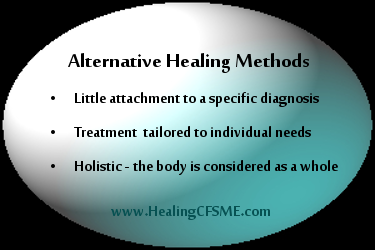 It is unlikely that an alternative healing practitioner will diagnose a particular illness. They will and should advise you to seek tests and diagnosis from a conventional Doctor. However, the practitioner may tell you if they have other patients with the same illness who have similar alternative healing test results to yourself. If you are not yet diagnosed, the practitioner's experience with other people may enable you to push your medical practitioner to send you to an appropriate specialist for diagnosis. The acupuncturist measures various pulses in your body to determine blocks in energy flow. The energy flows are then restored by inserting small needles needles into the body. I did not persevere beyond a few sessions of acupuncture. The practitioner said that my pulses rose during a session but the following week they were back to the previous levels. She was so honest that she said she was concerned she wasn't helping me enough. Although acupuncture did not change the Myalgic Encephalomyelitis symptoms for me it did reduce joint pain. I am also aware that back then, I was not good at resting, and did not have the support to rest. Perhaps under different conditions the acupuncture would have been more effective. My experience from myself and others is that acupuncture is well worth trying if you have any joint problems. Practitioners measure pulses in the same way as acupuncturists. I had a lovely practitioner who was very gentle with me and was willing to do house visits. Some practitioners will press on the body in a way which is too forceful for a person with Chronic Fatigue Syndrome. Kinesiologists use 'muscle testing' to determine which treatments your body needs. Kinesiology can be used to ask any question of the body which can be answered Yes or No. My understanding of the logic behind kinesiology is that your muscles connect with a greater source of knowledge than your conscious mind. You can learn muscle testing for yourself, though I personally would rather allow someone else to do it. Field Control Therapy is a alternative healing therapy which uses kinesiology and combines it with an approach that has some overlap with homeopathic principles. I tried it because I had heard of someone with mercury fillings and mercury overload experiencing great health benefits. A healer 'scans' your body with their hands to identify blockages. Spiritual healing works with the principle that God, the divine, is working through the healer. The practitioner asks for guidance as to where to move their hands. I certainly felt a lot going on, but there was no sustained improvement for me. If you live with chronic illness you may - like so many of us - explore alternative healing methods at the hands of a practitioner. But I would also advise you to engage in a self-healing technique at least once a day. It is cheaper! And allows you to receive a more sustained level of healing input. One example of emotional self healing is to use visualisations to heal your inner child. You give your younger self the resources she or he needs to have formed more life-affirming beliefs about themselves. Read 7 simple healing methods you can apply to your life each day. Advice to heal eczema from 54 different people in a forum. Which healing methods are most popular? Katina Makris experienced healing from lyme disease using alternative methods. Move to the home page - Alternative Healing Therapy for Chronic Fatigue Syndrome, ME and other chronic illness. Move to TOP of page.